Adding users one by one can be an arduous tax. Instead, you can easily import users into Checkbox, either by uploading a .csv file or copying and pasting user information from Excel. 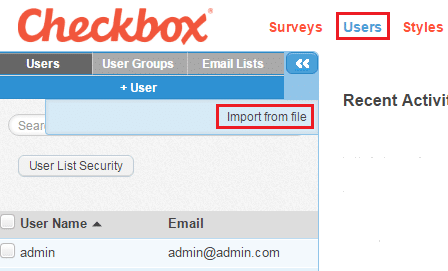 You can import both admin users and respondent (survey taker) users into Checkbox. 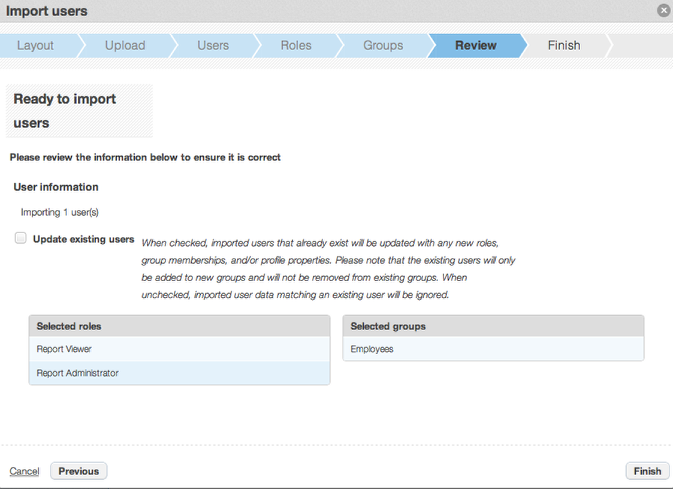 However, note that users must all be assigned the same role at import. For instance, you cannot import respondents and survey administrators at the same time – you would need to do this in two separate imports. NOTE: We recommend importing users in batches of less than 10,000 users each to avoid timeouts of the application. 1. Prepare your .csv file. Your .csv files should contain all the user profile fields you want to import (e.g. name, email etc.). 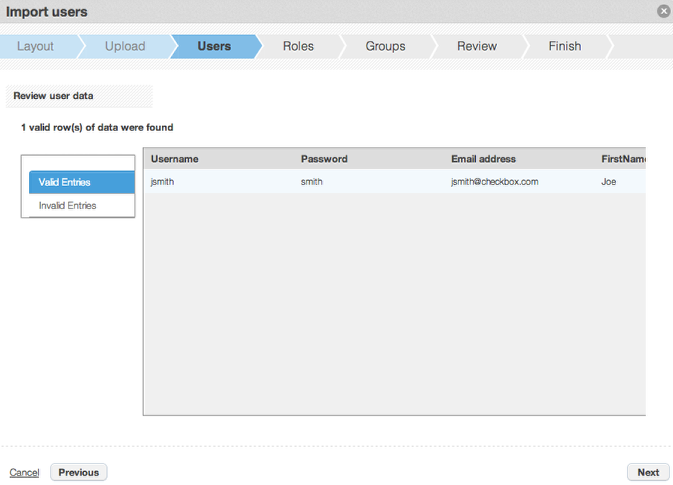 Review our guide on User Profile Properties if you haven’t set these up yet. At a minimum, each user that you are importing must have a unique username (we suggest using email address or a unique id). It’s up to you to decide what other information you want to import, depending on the User Profile Properties you’ve set up. TIP: You can import passwords for your user or, if you’d prefer, you can allow Checkbox to set a random password for each of your users. If you want Checkbox to assign the passwords, just omit the Password field from your import file. Then, when your users go to log into Checkbox for the first time, they can just use the Forgot Password link to reset their passwords. 2. Click the Users link at the top of your application. Hover over the +User button until the Import from File option drops down (choose this option whether you are importing a file or copying and pasting). 3. Choose the columns you want to import or copy/paste from your .csv file. Choose the Profile Properties from the left column and add them to the right column of the layout wizard. 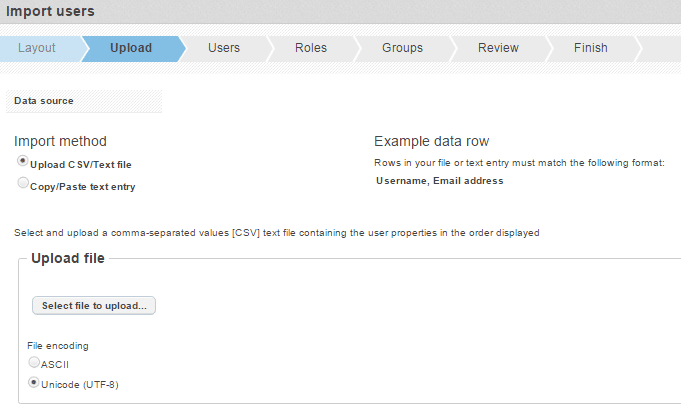 *Make sure that you add the Profile Properties in the same order that they appear in your .csv file or spreadsheet. For instance, if your .csv file’s columns are Username, First Name, Last Name from left to right, the right-hand column of the layout wizard should display those same three labels in top to bottom order. If you move them over in the incorrect order, you can use the up and down arrows on the right to rearrange them. Click Next. 4. Choose to upload a file or copy/paste. Click the radio button for either file upload or copy/paste. If you are uploading a file, click the ‘Select File to Upload’ button and browse for the file to upload. If you are copying and pasting from excel, paste your columns into the box provided. 5. Verify the import. On the next screen, verify that your data looks correct. Make sure to check the Invalid Entries tab for any rows that can’t be validated. If you would like to change anything, click the ‘Back’ button to re-paste or re-import. Click Next. 6. Assign role(s) to your users. 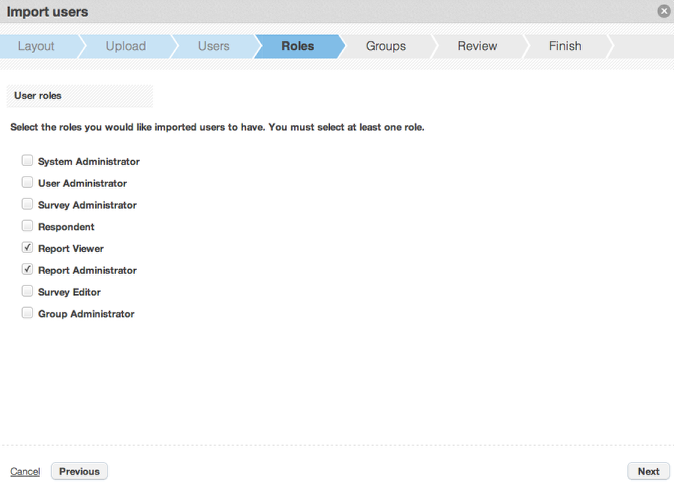 Choose which role(s) you would like to assign to your users. View our Roles Guide for more information on user roles and permissions. Click Next. Note: All users in a single import must be assigned the same role(s). 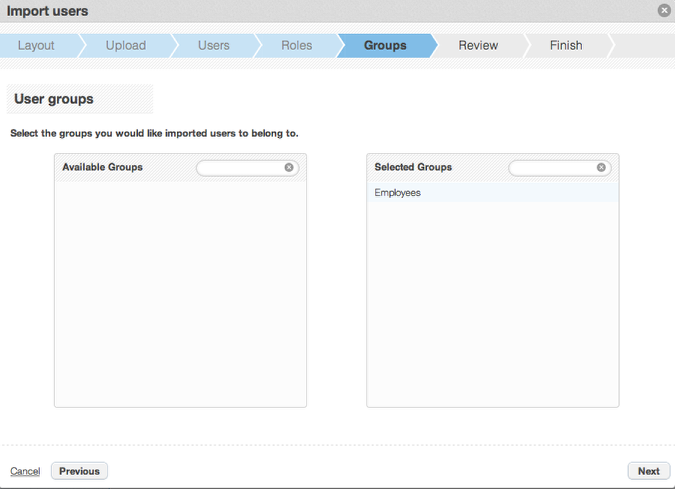 If you would like to assign your imported user’s different roles, you must import them in separate batches. 7. Choose the User Group(s) you’d like to add your users to. On the next screen, choose which groups (this is optional) you would like to add your users to. If you do not see any available groups, you have either not set them up or do not have access to them. To add a new Group, click Users -> User Groups -> +Group. TIP: You may use the User Import function for the sole purpose of quickly adding users to Groups (rather than doing it manually, one by one). 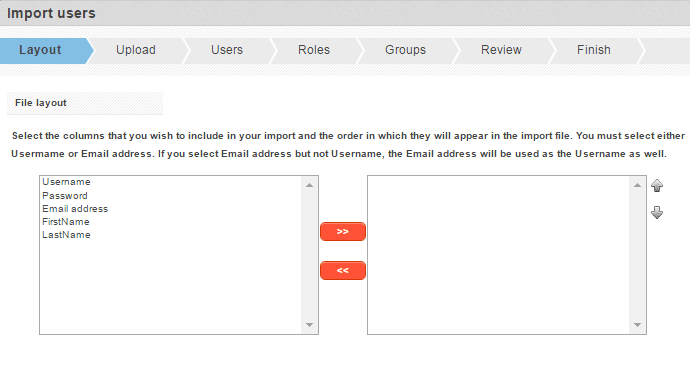 To add existing users to a new User Group in bulk, import only the users’ User Names, do not change their roles on the Roles screen, and add them to the new group on the Groups screen of the import wizard. Then, on the next screen, make sure you check off the option to “Update existing users.” This will update the users’ profiles with the new User Group, but will not change anything else about the user. 8. Review and Finish. On the next two screens, review and finish your import. If you would like to make any changes, click the ‘Back’ button before clicking ‘Finish.’ Make sure you receive the confirmation message that your users have imported successfully before closing the import wizard window.